I remember buying this graphic novel back when I was still in high school, and it’s still really interesting how the story still strikes a chord with regards to my sympathetic appreciation of the most hated Batman’s enemies. Indeed, it only takes a bad day is enough to put a former clerical staff a at a chemical processing plant who resigned from his job to become a stand-up comedian, who has a pregnant wife, a backlog of bills, and not to mention the fact that the whole career move that he made is seen perceived as a stupid move by everyone around him. But his fate seems to change as he is given a break by thieves who asked the clerk-turned-comedian to help them break into the chemical plant that he used to work in. However, a few hours before the heist the man comedian who would in time become The Joker got a call from a doctor telling him that his wife died from a freak accident in an electronics store while testing a water heater, realizing that he has nothing left to live for he tried to walk off from the heist, but the crooks told him that he can’t back-off, so reluctantly he guides them through the chemical plant. During the heist they ran into plant security and eventually Batman who out of fear caused him to jump into a pool of chemicals causing him to disfigure his face and eventually lose his sanity transforming him to the homicidal Joker. 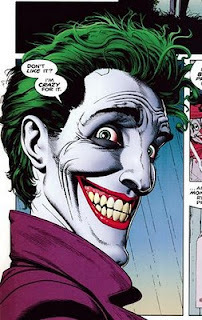 The life of the Joker in Alan Moore’s, Batman: The Killing Joke reveals a tale of insanity and human perseverance. Looking to prove that any man can be pushed past his breaking point and go mad, The Joker attempts to drive Commissioner Gordon insane, after shooting and permanently paralyzing his daughter Barbara (aka Batgirl), The Joker, kidnaps the commissioner and attacks his mind in hopes of breaking the man. But refusing to give up, Gordon maintains his sanity with the help of Batman in an effort to best the madman. The Killing Joke perfectly complements the late Heath Ledger’s outstanding portrayal of The Joker, as it brings the reader/audience face-to-face with themselves in that perpetual quest to maintain sanity in the face of horrendous evil in the world that we presently live in.